I’m totally unprepared even though I’ve been here before and have seen it thousands of times in photos. It’s true. Described by an Indian poet as a “Teardrop on the Face of Eternity” the Taj Mahal is the most beautiful building in the world. The pure white marble domes, arches, and minarets, the lattice screens and bas-relief carvings of flowers and the massive, welcoming and comfortable proportions startle me. I’m taken aback; it is so perfect I hardly notice all the others here although, like every other day of the year (except Fridays,) there are thousands of visitors. Do they all feel like I do? 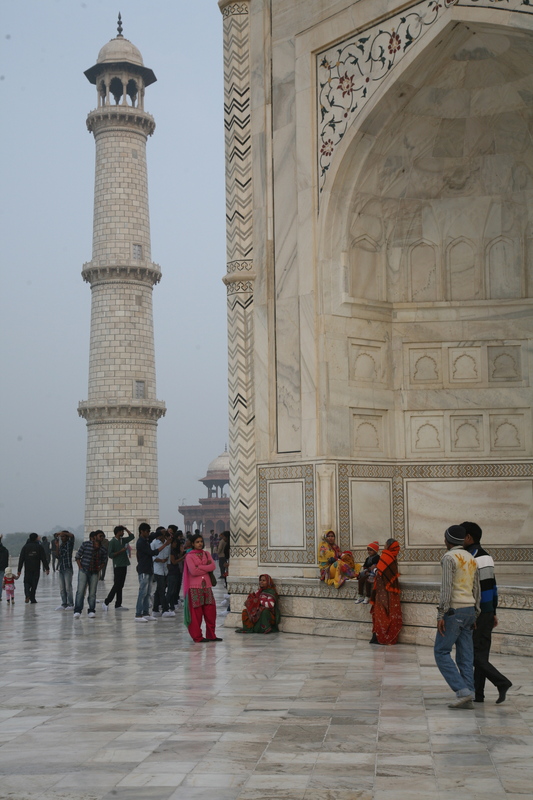 The Taj Mahal mausoleum houses the remains of a much-loved woman, Arjumand Bann Begum, who died when she was thirty-nine years old after the birth of her fourteenth child in 1631. She’s best known by her palace title of Mumtaz Mahal that means “Chosen One of the Palace”; her husband was Shah Jahan, the Emperor of India. It is said that Mumtaz Mahal was one of the most beautiful woman in the Mughal world and I think she must have also been beautiful inside her heart. Unlike most marriages at the time hers was a love marriage. The Shah was twenty-one when he first met her in a jewellery market. She was pretty, friendly, talkative and smart but she was not a member of the royal family so the Shah’s family forbid him to marry her until he won a couple of wars. Which he did. Promptly. The Shah was devastated when she died twenty years later and to her memory he set out to construct the most beautiful monument in history. 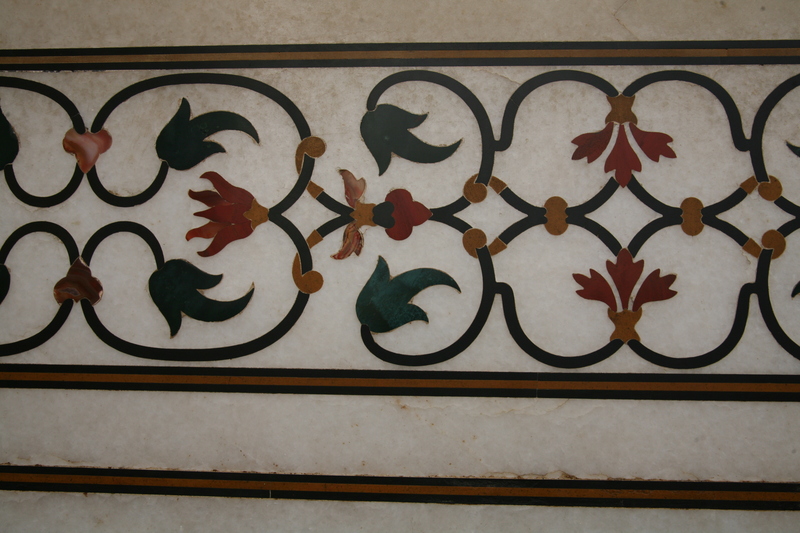 He hired 22,000 craftsmen and other workers who travelled to Agra from all over Central Asia to work on it. Twenty years later it was complete. I don’t know Mumtaz but I feel her presence here at the Taj Mahal. Did she love her gardens and nature? Yes, I’m sure she did; I can see it in the beautiful design and flowers carved into this pure white marble that is the hardest, most non-porous marble in the world. Iris are inlaid with lapis lazuli, orchids with amethyst, daffodils with jasper, tulips with coral and leaves with jade. 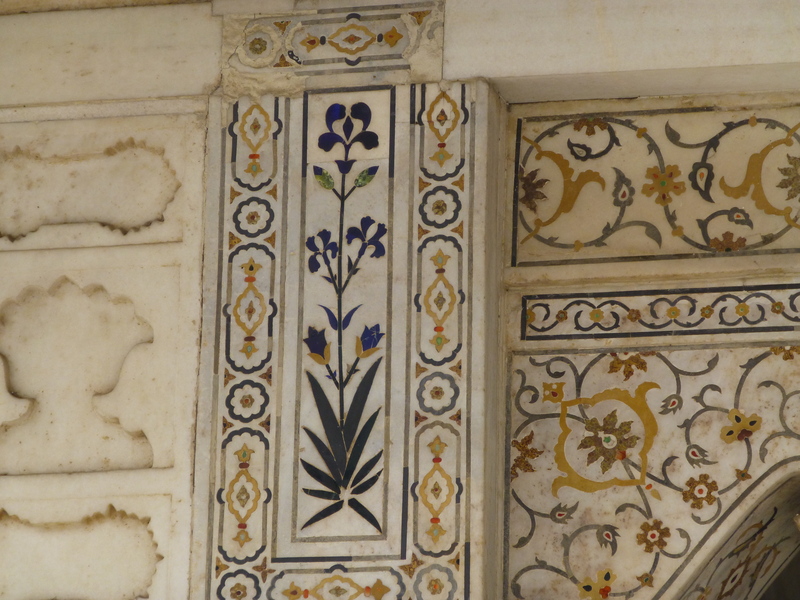 Are they examples of the flowers Mumtaz loved from the palace homes of her ancestors in Persia? 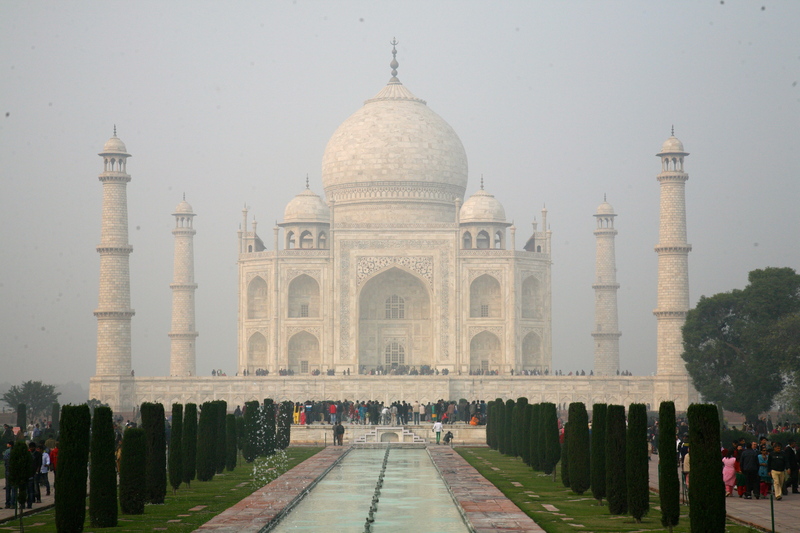 Her tomb, the Taj Mahal was built to last. Now it’s simply washed with soap and water every few years. 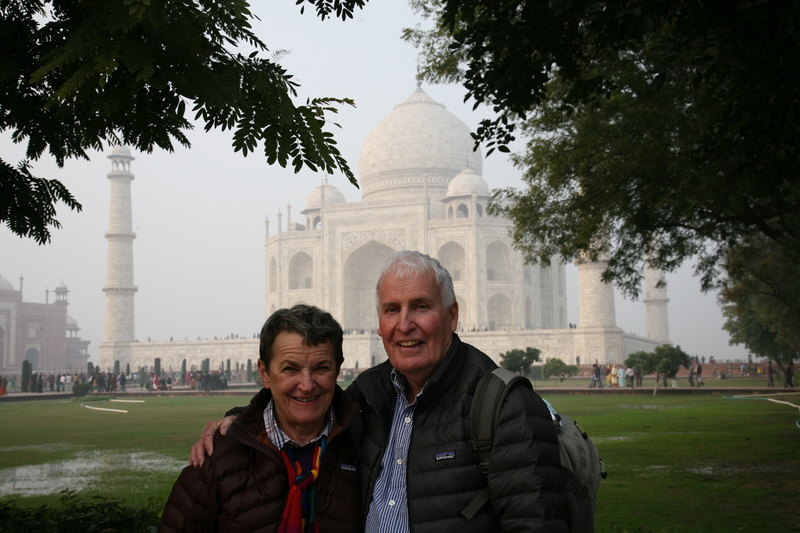 There are 5-6 million visitors a year (it’s one of the seven wonders of the world) and to get into the Taj complex we’ve all been through a serious security check (after being told not to bring in any food, electronic devices, knives, weapons, or pencils.) We walk through a bomb checker thing-a-ma-jig and then guards with big guns search every bag; other security people (one line for men and one for ladies) pat us down. (Ross had the glue he carries for his journal project taken away yesterday and today they wouldn’t let him in with his sketch book and pencils.) Then we put special covers on our shoes. Strangely the magnificence of the Taj for me is not diminished by all of this. In fact I feel as though I’m all-alone here … it’s just me immersed in the beauty of the Taj so that I can enjoy my imagination and the stories of history it holds inside.